When you are designing a 1,480-horsepower car that can top 250 mph, cooling and aerodynamics become very important factors. That was the task Bugatti director of design Achim Anscheidt faced when drawing up the Bugatti Chiron, and he came to the same conclusion. “The main elements that you see on this car, from the rear, from the side, and the front, are based on form following performance,” Anscheidt said in an interview at the Geneva Motor Show. The increases to horsepower, torque, and top speed, and the resulting aerodynamic requirements meant the designers had to work with the engineers to make this car possible. “The limits were so high that we realized we can only achieve this with a win-win collaboration of design and engineering. And that set up a system that gave me a chance to solve technical issues to better the performance,” Anscheidt said. Anscheidt feels this type of design gives a car longevity. He compares it to Bauhaus buildings in Berlin. Almost a century after they were built they aren’t contemporary, but they are beautiful and they represent their era. Longevity is important to Bugatti because this is the type of car that a buyer can pass down to the kids or grandkids. That C shape dominates the side of the car, and while it has historic ties, it is really about function. “It looks like a romantic sideline and you can identify it with the signature of Ettore Bugatti or the Type 41 or even the signature of Louis Chiron. But the real reason for that line is a performance function,” Anscheidt said. He further explained that the C is one large intake that the car’s massive W-16 engine needs. The air that travels along the body side is relatively turbulent and it arrives with about 60 percent efficiency in the lower portion of the C’s massive air intake area. The air that runs along the greenhouse arrives with 85-90 percent efficiency at the top of the C’s intake. The rear end has a cutaway look, which Anscheidt says is nothing new for a supercar. However, aerodynamics and cooling play a large role here. “The soft pressure zone is extremely strong behind the car, and that allows all the hot air to get sucked out and that’s why all the ducts are in there. Otherwise, the power increase of 25 percent would not be possible to handle,” Anscheidt explained. The rear spoiler plays a big role in aerodynamics. Bugatti made it an active, full-width spoiler for best performance. At rest, it is completely tucked away so as not to disrupt the car’s lines. However, it comes up at 50 mph and raises to various levels. It mainly acts as an airbrake, tilting up to 90 degrees. 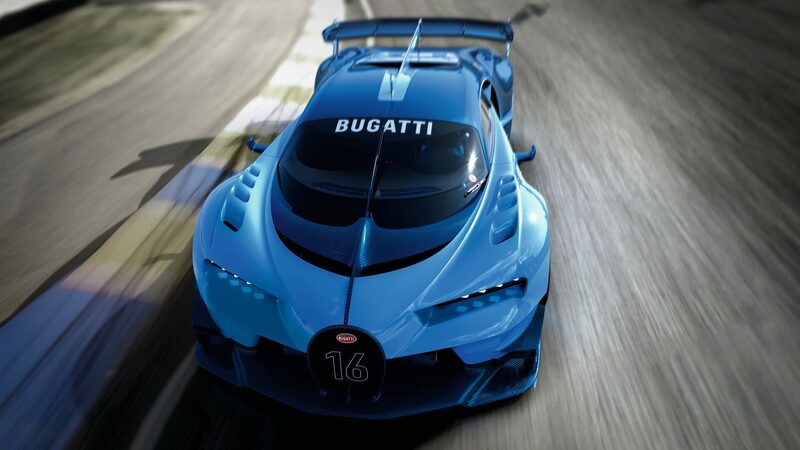 “If you’ve ever had a chance to come down from 400 kph [248 mph] to 0 as fast as you can, you realize how important an airbrake is for Bugatti,” Anscheidt said. 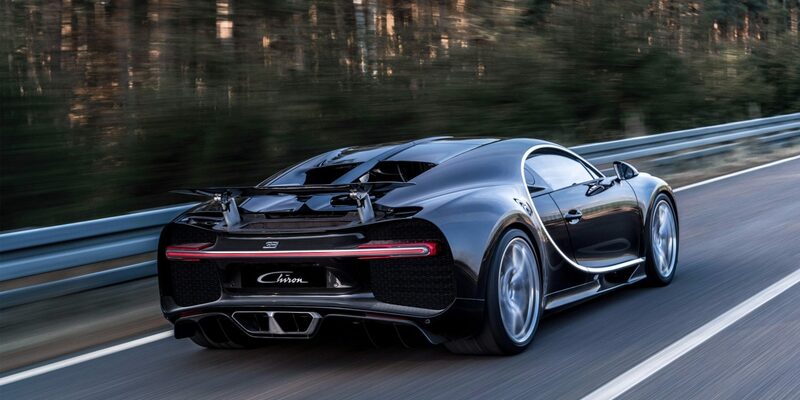 The rear end is more efficient than the Veyron’s, meaning the Chiron is capable of achieving higher top speeds. Right now, Bugatti says the top speed is limited to 261 mph, but the company is not saying how fast the Chiron or a version of it can ultimately go. Like the rest of the car, the front end is all about cooling and aerodynamics. “One of the most critical things about a supercar is the front brakes. When you drive it hard, the first thing that’s going to give is probably the temperature of the front brakes because that temperature goes into the wheel and that goes into the tires, and then the tires start to get really soft,” Anscheidt said. To combat that issue, the car has air intakes in the headlight design. That air leads directly down to the brakes and pushes the hot air out through the wheels. The lower air intakes are more conventional and they help cool several radiators, as well as the brakes. Of course, the most pronounced element of the front end is the horsecollar grille. It is designed for airflow, but its look goes all the way back to the first Bugattis of the 1920s. There are other nods to the past as well, and they are almost exclusively based on the Type 57 Atlantic of 1938. Just four of those cars were ever built, but they are viewed as the high point of Bugatti design. “The Atlantic is such a strong asset in our history. We in the design studio cherish that car,” Anscheidt said. For inspiration, Anscheidt and his team examined a perfect example owned by noted collector Peter Mullin. The Atlantic also provided the inspiration for the strong center line of the car. It starts up front behind the grille and extends all the way down the spine of the car.